The MB Estate mini-continent in Metropolis consists of a rectangular grid, 11 regions west-east and 5 regions south-north, so in total 55 regions, roughly 20 regions southeast of the Metropolis center. The basic layout is two 3x3 region islands, an eastern with a Europe map and a western with various regions, and an easternmost appendix with a private home island, all surrounded by water regions. Several of these water regions are however used for roads and development, so even if just 17 regions are land regions, only 7 regions are open sea. Map of the MB Estate mini-continent, with region names. The Europe map (Europe C), covering 9 regions, is in horizontal scale 1:10000 and vertical scale 1:250, to better highlight the topography both above and below water. It's surrounded by a massive, decorated brick wall with towers and a road on top spanning 16 regions, because the sea level needed to be raised 20 meter above the surrounding regions' sea level to permit the vertical scale of the sea floor. West of the Europe map, along the western edge of the mini-continent, there is an elevated, winding waterway spanning 5 regions (MB Sea 11 - MB Sea 15) which is both a design study for a fantasy waterscape and a testing ground for physical vehicles. A large suspension bridge (Bridge) spans the central part of the strait separating the western and eastern islands. 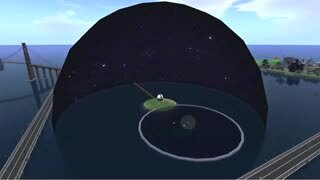 In the strait is also a sculpted model of the Earth (Earth) in scale 1:100,000 with an attenuated topography at scale 1:1,000 both above and below sea level, similar to that of the Europe map. 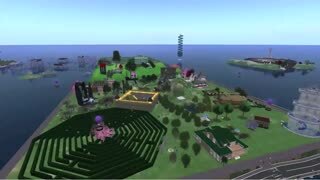 The strait also houses a map of all of Metropolis (Map), although compressed outside the central area, offering information about all regions and direct teleport to all reportedly online regions. The map is currently offline owing to technical problems. The eastern 3x3 region island is surrounded by a road bridge spanning 16 regions. The road is decorated with flowers, street lights and road signs, has several functioning (time-cycling) traffic signals and side roads to the island regions. The eastern island contains one region with thousands of free RAW terrains for use in OpenSim or Second Life (Terrains), a region presenting media including hundreds of videos from Metropolis (Media), an astronomical region (Astronomy) with a small observatory, an orrery and a region wide rotating starry sky where star attenuation and grids can be changed, a region with a maglev railroad under development (Railway), a presentation region (MB Estates) with 3D statistics for grids and the continent, a continent snapshot exhibition, a few minor sandbox areas and a large comparison of historical and present maps of the Stockholm region in Sweden high above, a region-wide maze (Maze) with chasing sentinels, and two beautifully chaotic, artistic and charming regions (Maggie's and Maggie) mainly by Maggie Binder. A water region in the eastern island (MB Sea 72) holds a small chemistry display. Annexed to the eastern island is also a sandbox with a train concept (Magnuz) and a region for full-scale display of RAW terrains through a vendor (MB Sea 65). East of the island and separated from it by another strait is a private region (Magnuz's & Maggie's) which is the home of the owners Magnuz Binder and Maggie Binder. In the southeastern corner of the continent there is also a hexagonal palace under construction (MB Sea A1), and a cityscape under development (MB Sea B1). View of the eastern island of MB EState, with the region Maggie's in the foreground. Separate from the continent are also 11 var-regions, Magnuz 8, 2048x2048 m in size, used for large-scale landscaping experiments, Terrains 1, Terrains 2, Terrains 3, Terrains 4, Terrains 5, Terrains 6, Terrains 7, Terrains 8, Terrains 9, and Terrains 10, between 256x256 m and 2560x2560 m in size, used for previewing full-region terrains and linked by teleport pads from the main terrain shop at Terrains. Magnuz and Maggie Binder came to Metropolis 2013-02-09, set up their first sim and region the day after, 2013-02-10, created 45 water regions as placeholder for the MB Estate mini-continent 2013-02-17, added the 9 region Europe map 2013-02-18, 8 more full regions 2013-02-19 with content restored from OAR's for Astronomy, Magnuz's & Maggie's, Maggie's, Maze, MB Estate and Terrains, while Binders, Maggie and Magnuz were new, and the region MB Estates wasn't joined to the mini-continent until 2013-02-22. During the period 2013-02-28 - 03-02 the mini-continent was restructured into single-region sims, and 2013-12-18 9 more sea regions were added around the private region Magnuz's & Maggie's. The 10 varregions Terrains 1 - Terrains 10, for previewing terrains, were added 2015-01-24, and the varregion Magnuz 8, for landscaping, was added 2015-07-17. The content of the mini-continent has been created during several years, with the Europe map being the oldest part, originally created as a one-region map over Scandinavia for an OpenSim local standalone 2009-01-19, expanded to the present 9-region terrain over Europe for a private VPS OpenSim grid 2009-02-01, city markers added 2011-07-28 and country flags 2011-08-18, and made public on a dedicated server 2011-11-24. 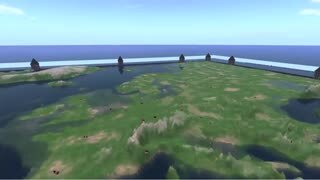 The 66 single-region simulators are served by OpenSim 0.8.2.0 Dev PLUS Metropolis Edition  (Unix/Mono), run on Ubuntu 14.04.3 LTS 32 bit with Mono 3.2.8 and MySQL 5.5.46, on a dedicated server Intel Core i7-3770 3.40GHz, with 32 GB DDR3 RAM, 2 x 3 TB SATA 6 Gb/s HDD 7200 rpm Software-RAID 1, rented from Hetzner Online AG, Gunzenhausen, Germany. Zuletzt geändert von Magnuz Binder am Fr 1. Apr 2016, 12:26, insgesamt 18-mal geändert. This is a listing of all the regions in the MB Estate continent, with names linking to the Metropolis Teleporter pages, the (Y) after the name linking to a short presentation video on YouTube, and a short text presentation. A few "editor's choice" of videos have been highlighted with a thumbnail above the listing linking to the YouTube video. This region contains astronomic exhibitions, information, images, and models, still under construction. At present there is an interactive rotating starry sky, and two observatory buildings. The region is mainly an education and science region. This region contains a common sandbox for Magnuz and Maggie Binder, without building permissions for outsiders. At present it's just a pimple island with some minor debris scattered around. The region is mainly a sandbox region. 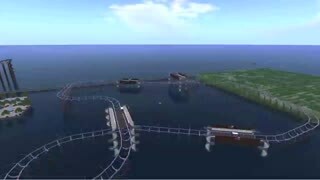 This region contains an open sea straight, with an elaborate full region road suspension bridge, connecting the wall around the western Europe map, and the road around the eastern islands of the MB Estate continent. The region is mainly a tourist region. 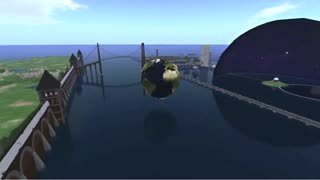 This region contains a model of the planet Earth, with 3D topography in scale 1 to 250000, with altitude attenuated by a factor of 100, in scale 1 to 2500, 51 meters in diameter, from 288 sculpted prims, hovering above the sea. The region is mainly a geographical region. These regions contain a 3D topography map of Europe and surroundings, spanning 9 regions, length scale 1 to 10000, height scale 1 to 200, with nation flags, major city markers, and information. The regions are mainly geographical and tourist regions. This region contains a charming little sandbox landscape, with all own and novel builds, growing into a tipsy little town, mainly created by Maggie Binder, with some assistance from Magnuz Binder. The region is mainly a sandbox and tourist region. This region contains a relaxing area for everyone. Take a balloon ride, or relax in a spa. There are chapel, castle, dance floor, and a maze. No stores, no stress or fights please. The place is only for relaxation. Welcome! The region is mainly an art and tourist region. This region contains experiments in shape and function by Magnuz Binder. At present it holds a small futuristic multi-cart magnetic levitation railway. The region is mainly a sandbox region. This region contains the home for Magnuz and Maggie Binder, created with love, care, and playfulness by Maggie, with some technical assistance by Magnuz. The region is a private home region. This region contains a full-region teleport map of the entire Metropolis Grid. It is a good start, both to get a convenient geographical overview of the Metropolis Grid, and to go exploring by teleport. The region is mainly a teleport hub region. This region contains a terrain-created, sim-wide maze, with escape preventing glass roof, and stupid but stubborn sentinel robots chasing visitors, to cage them temporarily on their way through the maze. The region is mainly a game region. This region contains 3D statistics for grids and the continent, a continent snapshot exhibition, a few minor sandbox areas with experimental builds by Magnuz Binder, and a large comparison of historical and present maps of the Stockholm region in Sweden high above. The region is mainly a tourist region. This region contains some exhibitions of morphing art and many videos from Metropolis, in the very center of the MB Estate continent. The region is mainly a culture region. This region contains a futuristic monorail, with 2 tracks, 4 vehicles, automatic track generation, working signals, but still much under construction. The region is mainly a vehicles region. This region contains terrains, for viewing and free download, as RAW files. There are some 80 smoothly rolling, 20 mazes, 40 geometric, 3 multi-region, thumbnails and sculpt previews. The region is mainly a freebies region. These regions contain an elevated winding waterway spanning 5 regions, and part of a large elaborate brick wall, with towers, a nice and scenic walk on top, spanning 16 regions, around a 9 region topographic map of Europe. The regions are mainly tourist regions. These regions contain open sea, and part of a large elaborate brick wall, with towers, a nice and scenic walk on top, spanning 16 regions, around a 9 region topographic map of Europe. The regions are mainly tourist regions. These regions contain open sea, part of a long decorated bridge road around the eastern islands, and part of a large elaborate brick wall around a multi-region Europe map. The regions are mainly tourist regions. 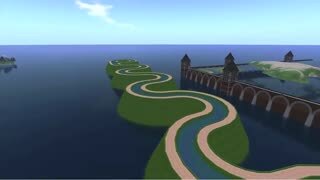 This region contains a full region preview of raw terrain files, and a decorated bridge road, with working traffic signals, spanning 16 regions around the eastern islands of the MB Estate continent. The region is mainly a tourist region. This region holds a small chemistry display. The region is mainly an education and science region. These regions contain open sea and a decorated bridge road, with working traffic signals, spanning 16 regions around the eastern islands of the MB Estate continent. The regions are mainly tourist regions. 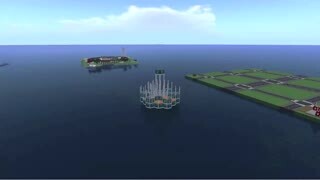 This region contains open sea and a hexagonal palace under construction. The region is mainly a sandbox region. This region contains a cityscape under construction. The region is mainly a sandbox region. These regions contain only open sea at present. Zuletzt geändert von Magnuz Binder am Fr 21. Aug 2015, 21:50, insgesamt 5-mal geändert. Breathtaking. It is just fun to see that all that different stuff is there (which is the biggest motive for me to explore virtual worlds). I also searched for more images from Metropolis on Flickr, but unfortunately couldn't find many, save for a 4 year old HyperGrid travel report. If anyone has or knows about more images there, please let me know, since i would be happy to link them. I can't be adding flickr to my things to keep up with, but you are most welcome to use any images here that you want. Not sure why they could not be found in search but possibly how I name them. I will look into that. @Miney: You have done a great and tremendous job promoting Metropolis over the last year or so, but you really don't need to track all my little side projects. I understand your time and energy are limited, just as my own are. I'll try to use some of it in my own low-profile way to make material from and about Metropolis more visible and available than most is now, even if I'm not much good with design, social media and such. hehe Dings, what you'd say ... . But philo is saying: You can never waste your time, because you will - on the other side - never reach a goal that finally satisfies you. .
Well, ty for the compliment, but I was really meaning to just say that I have enough trouble keeping up with what little I do now, which is much less than I did and likely will continue to be cut back even more...I suppose it would have been better said to leave out the "time" aspect and just say "energy". Really I was just offering whatever photos I have on that blogpage to you to use adding to your flickr if you wished to. I was not meaning to imply my time is important, at all, as it is not important, at all. Anyway, language issues on my part, I think. What you do is wonderful and fun...I think it is just great of you to do, as I do with anyone who does their own style of promoting the interesting things happening in the Meta, as Zaphod Enoch has recently added to. I think that as we continue to do our own parts in showing the rest of the Meta and even the wider net world, wonderful things going on, we get curious people to come check it out. This is why, imo, I see the sl clone closed commercial grids not doing very well, there simply is not much of anything interesting to hold most people's interest. You go into one and all you find is boring builds [tho of course there are some exceptions but once you see them then that is all there is to it...a house is a house is a house] and boring clubs with boring people asking for your virtual monies for boring sameo sameo events, boring over-commercialistic sameo sameo. For my own little part, I like to just do my photos with HG addresses and sometimes some words....I want to tease people into wanting to see it for themselves. I never spend the time with more in-depth promoting as Zaphod does....which I also like very much. What you do I could also never do, and it really showcases what can be done, by those types of people who like doing such things...and give pleasure to those who simply want to find interesting things. There are 2 new HG exploring groups running around now. I need to try and get a suggestion to them to check out your regions.